Supporters pack council chambers in support of a ballot initiative. The first City Council meeting of the year was uncharacteristically unruly and dramatic, with an exasperated Council President Ben Stuckart gaveling the meeting to a close early and storming out during the public comment period for a controversial initiative related to how Spokane police handle undocumented immigrants. At issue was a proposed ballot initiative from Spokane resident Jackie Murray that would reverse a city policy that prohibits city employees, including police, from inquiring about someone’s immigration status. The measure drew over 30 people to City Council chambers to testify. Many of them were older. Most of them were white. A few didn’t even live in Spokane. Some spoke about how this was an issue of equality before the law. Some speakers invoked concerns that the policy would make Spokane a magnet for “terrorists,” “criminals” and “illegals” who would be a drain on resources. Some cited things they had heard on Patriot Radio and other conservative media. A handful of people defended the city’s policy and pushed back against those who supported the effort to strike it down. “I am disgusted so far with the testimony from the public,” said Alfredo Llamedo, a social work student at Eastern Washington University, who told his story of immigrating from Cuba as a child. “This is the land of opportunity, not of hate, and all I've heard tonight is hate,” Llamedo told the council. Stuckart, whose father passed away last week, warned the audience that he was “short-fused” that evening and that he would gavel the meeting to a close if people broke council decorum by applauding and cheering during the public comment period. 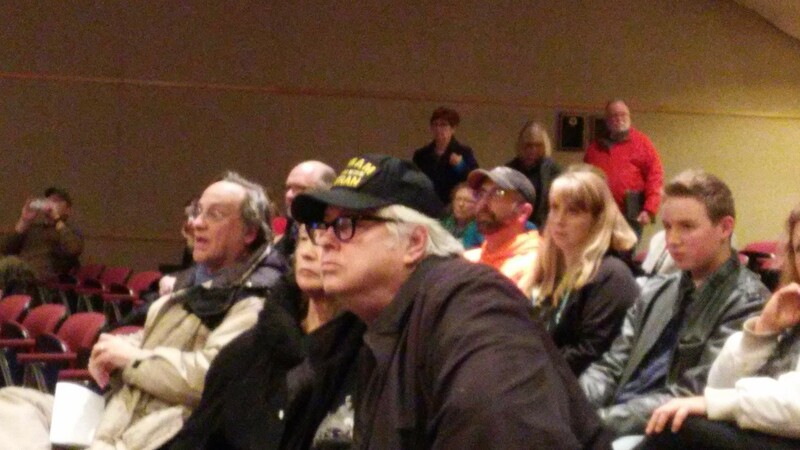 After the crowd continued to ignore Stuckart’s warnings he testily said “that’s it” and gaveled the meeting, sparking an uproar from people in attendance. George McGrath shortly before being evicted. George McGrath, who regularly speak at city council meetings, stepped up to the microphone and began berating the decision, calling it “iron-fisted.” After he refused to step down, he was escorted out by a police officer. Councilman Jon Snyder, who serves as president pro tem, told the crowd that the council meeting would continue if people agreed to respect the rules. “This has never happened ever in the five years I've been on council because people respect the rules that we have here,” he said. 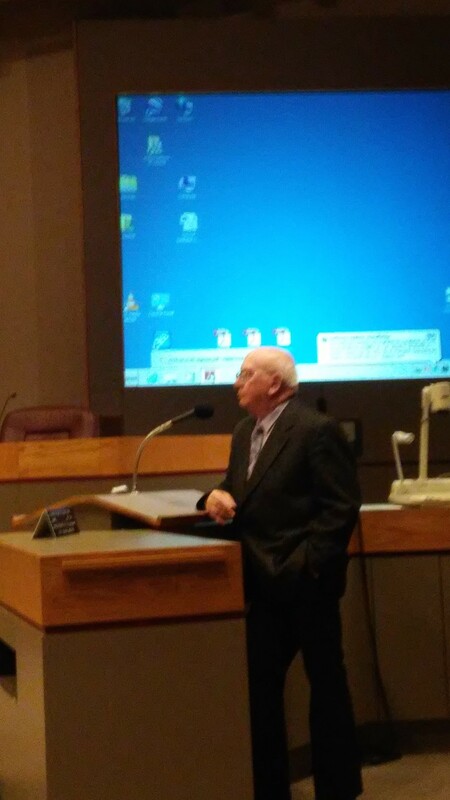 After public comment resumed, Murray, the sponsor of the initiative, addressed the council. Earlier in the night, she had a terse exchange with Stuckart when the council passed an ordinance that required political committees active in Spokane to have at least one officer who is a registered voter in the city. The ordinance was crafted to prevent political groups from outside Spokane from trying to influence local elections. Murray, whose initiative is sponsored by the group Respect Washington, expressed concerns that it was targeting her, which Stuckart denied. Murray told the council that her initiative was about fairness. “My father is a legal immigrant from Jamaica. I'm black,” said Murray. Under city law, when a citizen initiative is sponsored, the council has the option of voting it into law or sending it to voters, neither of which city lawmakers have done in living memory. If they do neither, the initiative is vetted by the city and supporters can begin collecting signatures. Councilman Mike Fagan introduced a motion to make the initiative law, which failed. He introduced another to send it directly to voters, which also failed. The initiative now goes to city hearing examiner to look into its legal validity. After passing that hurdle and going through the City Clerk’s Office, supporters can begin gathering signatures. It could be on the November ballot.